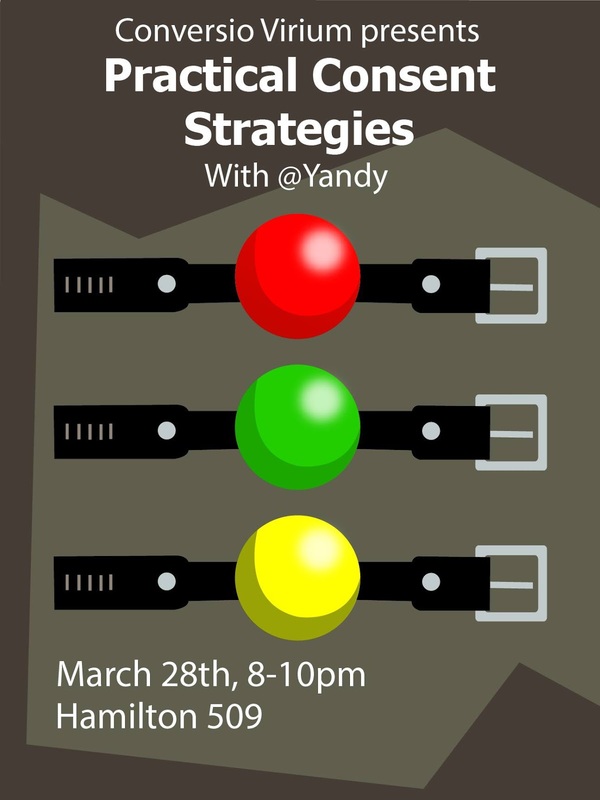 CV meeting 3/28: Consent with yandy! Andy is a trans*human genderqueer event planner, attorney and activist working to provide benefits and protections to queer and polyamorous families, and educator around positive consent practices, community accountability, and family law, including at the National LGBT Bar Association Conference, the Woodhull Sexual Freedom Summit, Columbia University, New York University, Skidmore College, the Eulenspiegel Society, and other schools, conferences, and kink, polyamory, and LGBTQ groups. Andy is also a poet and writer and has been published by 24 Magazine, Sibling Rivalry Press, the Yes Means Yes blog, and Sock Drawer Press. Current areas of nerdery include: sociolinguistics in technology-mediated communication, building the perfect vegan bootblack kit, integration of radical politics with legal pedantry, learning homesteading skills for when civilization collapses, and genderfucking your world. Current residence: NYC. Origin: Unknown, likely extraterrestrial.